Organic peanut butter – crunchy; no added sugar. 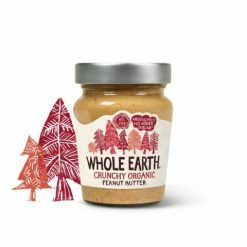 This crunchy organic peanut butter is delicious on bread or toast. Spread a little honey on top for a truly delicious treat. It contains a bit of added salt, and no added sugar. Whole Earth is a pioneer of organic and natural foods, which was established in 1967 by brothers Craig and Gregory Sams. Today, it is one of the UKEEs leading organic brands. Whole Earth bases its products on the principles of great taste and caring about the planet. The companyEEs peanut butter is the leading brand in the UK. It is organic, and packed with protein and fibre. It contains no sugar, is made only with organic peanuts, sustainable organic palm oil and salt, and is available in smooth and crunchy. There is also a 100% peanuts variety, again available as smooth and crunchy. Ingredients: Organic peanuts, organic palm oil, sea salt.